TGIF!! My favorite season is officially in full swing and I couldn’t be more excited. And yes, I had a love for fall wayyyy before blogging. I still remember when my dad would rake all the leaves in the front yard and jumping in them was the highlight of my day. Trick-or-treating was my favorite and I still remember dressing up as a “southern belle” and wearing one of those frilly dresses from Dollywood (did anyone else have one of those?!). Dressing up in college was a huge deal with so many costume parties to go to and over the years, the season has become more about taking long hikes, going to fall festivals and just spending time with friends & family. 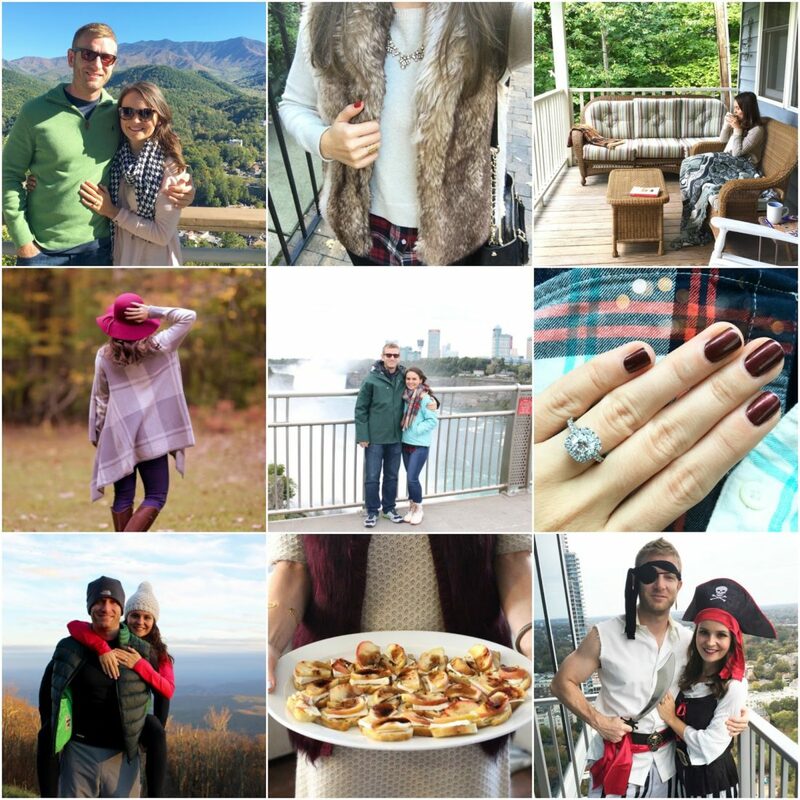 I thought it was only fitting to share this years bucket list on the second day of fall! Hopefully I can cross most of these items off the list, which is a little short because somehow almost every weekend in October is already booked up. So basically I need to get to planning STAT! I also wanted to share a few fun moments from last fall with you guys. And on a site note, y’all may have seen this on Snapchat (khendley) but I had to share on here. This coffee and caramel corn from Target are the bomb. Go stock up now… you’ll thank me later 🙂 Hope y’all have a fabulous weekend and thanks for stopping by! Great ideas! There is a haunted hayride near us that I really want to try! I love these ideas! Going up to Asheville while the leaves are still changing is also on my list of things to do this fall… you know, in between all of the football weekends 🙂 Have a great weekend! Eeeee!!! Loving your fall photos 🙂 Also, I need that vest!! Weekend trip to NYC sounds perfect! Love this list, hope you get to all of them this Fall! Thanks for sharing these photos, so cute! Have a good weekend. Yay for Fall!! I was just thinking about my Fall to do list yesterday! 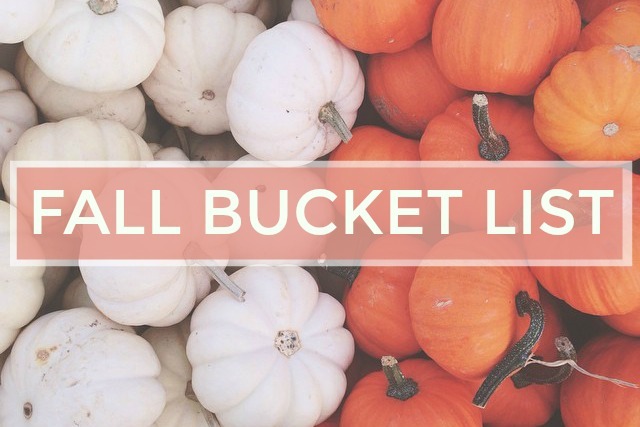 Such a great fall bucket list! I want to do so many of those things! what a great list! i have fall fomo so much right now but i guess it's still early 🙂 asheville in the fall is just gorg – i love that town! and fur vests and dark nails for days girly 🙂 happy weekend! Love all of these! Hocus Pocus is the best! Your pictures are so cute! YES to all things Fall!! I absolutely love watching Hocus Pocus during the Fall so that will most definitely be on repeat all October! I don't know if I can do a scary movie again (saw Don't Breathe and that was too much for me) or a haunted house, but those sound like perfect bucket list items! I had to resist buying all of the B&BW 3 wick's yesterday, gotta wait until those bad boys go on sale!!! Ahhh raking leaves and jumping in them is such a sweet childhood memory! Such fun! There is so much to take advantage of this season and I can't wait! That Apple Cider coffee sounds delicious! I love the idea of a friendsgiving. Do y'all do that instead as your Thanksgiving or host it before? 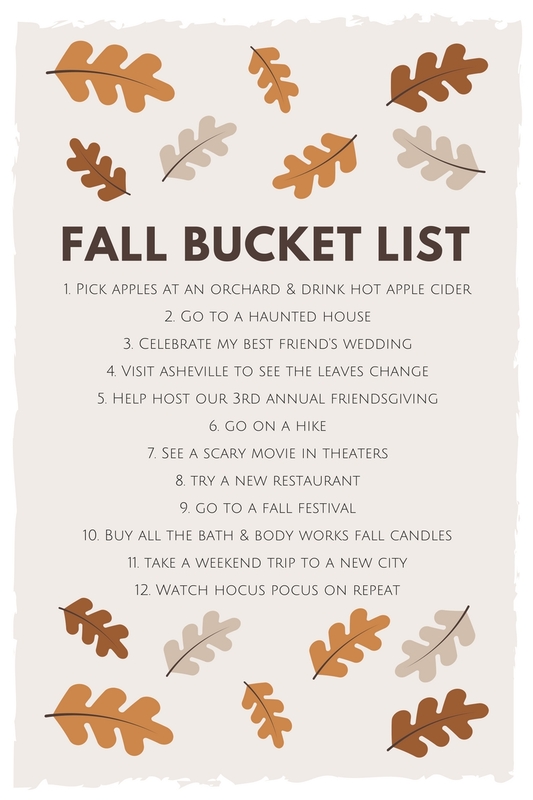 Great seasonal bucket list! I love fall candles! Omg, I kind of want to go to Target right now for that caramel corn!! It looks so good! And today is the day to stock up on B&BW candles – they're having a big sale!! Great list! I hope I can fit all that stuff in this fall too – so many great fall activities, so little time!! I want to go to a pumpkin patch so bad! I just came across your blog, and I was excited to see that you are a derm PA! I'm a 2nd year PA student and I want to go into derm as well!